I’m heading out a bit early today because the big day is FINALLY here – Closing Day! As of 3:00pm CST today I’ll be an official homeowner. It sounds so ridiculously adult and I couldn’t be more excited if I tried. (And believe me, I have!) It’s been 47 long days since I put in my offer. Now I can’t wait to start making the place really mine and I plan on sharing the entire process with you all. Wish me luck! 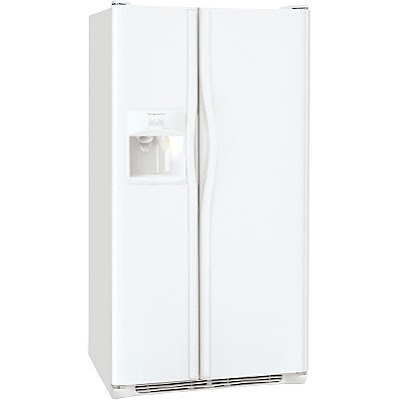 I bit the bullet and crossed off the final item off my To Set Up list by buying a refrigerator last night. It’s a Frigidaire. Nothing too fancy, although it is a side by side which I’ve never had before. And it does have an ice and water dispenser on the front which is the true sign of refrigerator success, not to mention a water filtration system. I never thought a fridge could make me so happy. Pathetic! Decorating is as much underway as it can possibly be without actually living in the new house. My closing date is all set for Wednesday, July 9th and I plan on painting the heck out of the place Saturday and Sunday before the movers bring all of my things Monday morning. 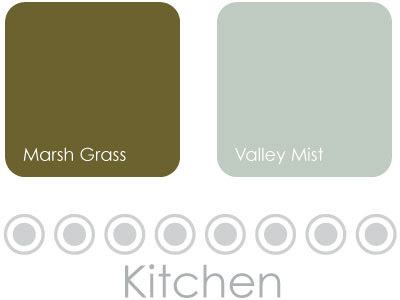 Being a designer I would have thought choosing paint colors to be one of the easiest things on my To Do List. WRONG. I’m being incredibly indecisive to the point of driving myself insane. So I thought I’d put it out there for you and get some opinions. 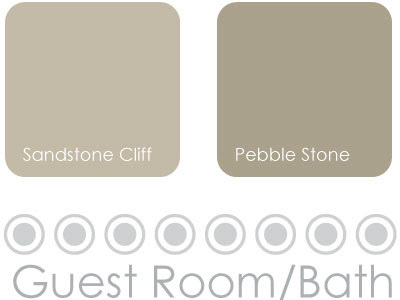 Below are swatches that are still in the contest for the rooms I’m painting. Please keep in mind that the colors seem to be running a little dark and a little on the yellow side (at least on my monitor) as opposed to the actual swatches lying on my desk at the moment. Which colors do you like? Hate? Have an idea for a color not in contention? Please share. 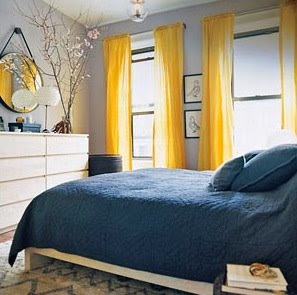 Ever since seeing Julianne Moore’s knack for decorating a few months back in Domino I’ve been obsessed with the color scheme in this bedroom. 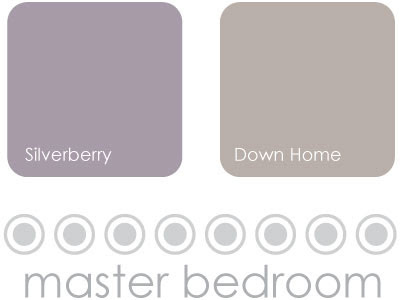 I’m stealing the wall color for my bedroom and am on a mad hunt for fabric to sew the curtains out of. (The only thing I’m shying away from is the navy bedspread – I’m way attached to my white down comforter.) I love the bright yellow and am not opposed to some sort of pattern (preferably white – circles perhaps? ), but want to keep it low-key since the yellow does a lot of talking on its own. I’ve found some nice Kona Cotton in canary yellow at Repro Depot, but am not 100% sold quite yet. Any suggestions for affordable curtain fabric? I’ve been pricing solar-powered walkway lights since finding out the house was mine. My walkway isn’t all that long so I didn’t need the ten and twelve packs most places were selling. Then yesterday I found a set of six stainless solar-powered beveled wedge lights for an absolute steal of a price. At Target of course. 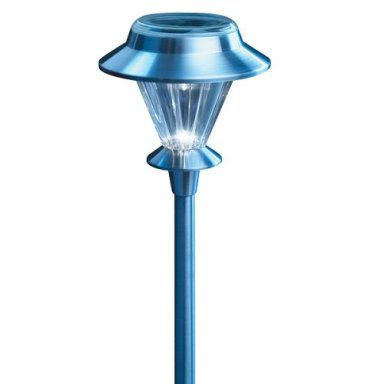 Does anyone have solar outdoor lights? What’s been your experience with them so far? Let’s Play House: Dining Set. Houses are expensive. And if you’re like me – single and not so high on the Career Totem Pole – they don’t leave much left over to spend on things you want to put inside the house. I only own two pieces of furniture from them – the NORESUND bedside tables and the EXPEDIT bookshelves. 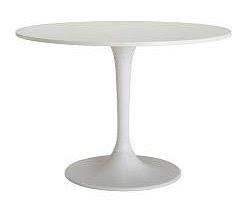 Right now I’m looking at the DOCKSTA dining table and either the GILBERT, NORDMYRA or NORVALD chairs to accompany it in my kitchen. I love the table and have a friend who owns it, so I’m not too worried. Which chair style would you choose to go with this table? Let’s Play House: Ceiling Fans. So, so many of you have inquired about my new house that I’m absolutely flattered! I don’t close until July 9th and won’t be posting any pictures of the place until I get everything in its place, but I am starting a new blog section – Let’s Play House. Here’s where I’ll be detailing the process up until the point I can show actual photos of mi casa. Saturday I headed to Home Depot for a ceiling fan and ended up leaving with not one, but two. One for the master bedroom and one for the living room. The living space has a vaulted ceiling and needs a little extra air flow. Both are from the Hampton Bay line. I haven’t decided which will go where yet, but I’m thinking the Four Winds (left) will hang in the bedroom because I have a black wrought iron bed, while the Edgemont (right) will go in the living room where things are a little more modern. And it has reversible blades – black and mahogany. The toughest decision so far? Paint colors!